Seville, one of Spain’s richest and most historical cities, is waiting to be discovered. Travel to Spain, and you’ll see how many hidden gems there are in Seville – the bursts of color everywhere, palm trees sticking high into the sky, Moorish influences around every corner and tradition seeping from all parts of the city. Here you’ll find some of the highlights of our guided tours of Andalucía described in a little more detail. As always, if you have any questions, don’t hesitate to contact us here. The Reales Alcázares de Sevilla, which was once an Arab palace and fortress, is now one of Seville’s greatest treasures and things to see. Join us on our Colors of Andalucia tour to get an up-close look at this beautiful piece of history. With our guided tour, you’ll weave your way around the labyrinths of gardens, wander through the palace and countless patios with grand fountains. The Arab-influenced architecture is truly something to see in Seville – the keyhole arches, the colorful tiles and inscriptions lining each and every wall and the colors that pop at you from all directions. Apart from the buildings themselves, there’s also the overflowing foliage and beautiful, bright plants adding a much-needed burst of green to Seville. Near the Alcázar, you will find the stunning Catedral de Seville and La Giralda connected to it. Once again echoing its ties to Moorish culture is this beautiful cathedral that was built where an Arab mosque once stood. 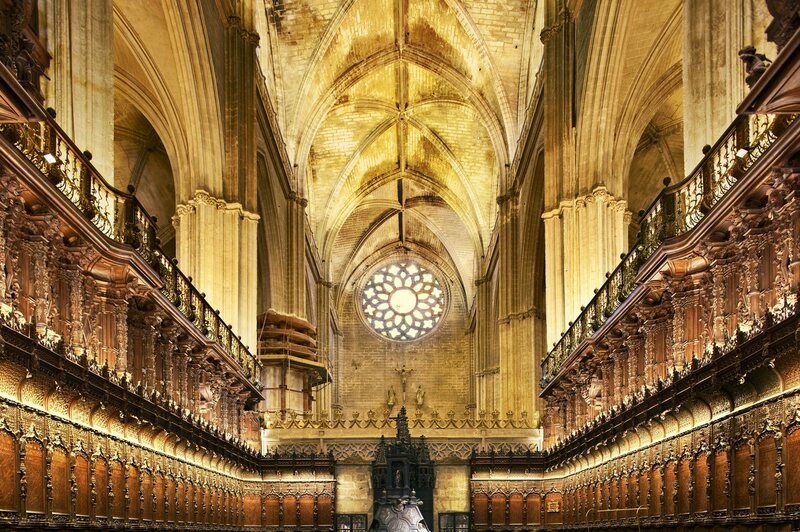 Come along with us on the Colors of Andalucía guided tour, and we’ll show you the secrets hidden within this historic cathedral. One of the most interesting things about this Gothic-style cathedral is the Giralda – the stunning bell tower that was constructed from the leftover minaret of a mosque. It’s hard not to notice the Arab influence all over Seville, and La Giralda is certainly no exception. After taking in such historic monuments, it will be time to see the new path Seville is paving for itself. We’ll take you to the Metropol Parasol in the city center. 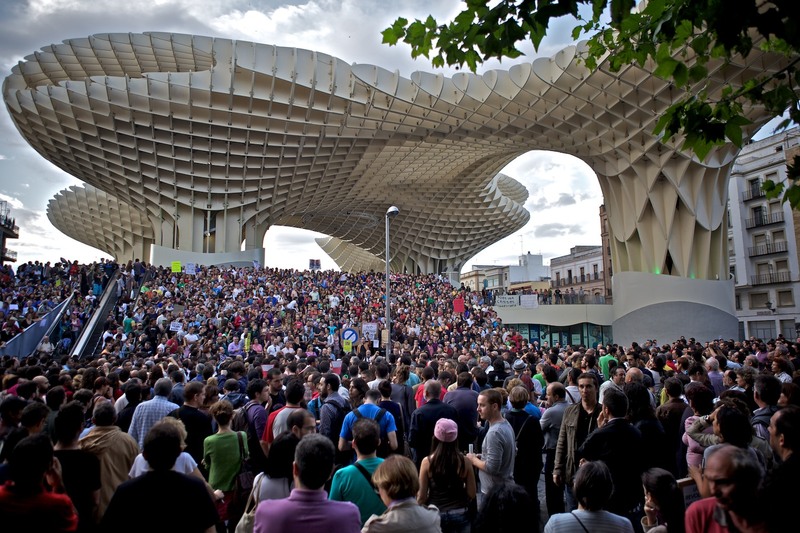 This modern structure, also known as “Las Setas” (the mushrooms) by the locals, is a new addition to the city whose waffle-like structure creates a stark contrast up against the aged buildings in the center of Seville. But it’s a welcome contrast, and it’s one that offers tons of new daily activities in Seville. In the Flavors of Andalucia guided tour, we’ll lead you through the market located just inside, and you’ll see for yourself just how original this place is. The Metropol Parasol also boasts an aquarium, restaurants and some of the best views of Seville. Apart from the city’s well-known monuments, there is even more to see. El Parque de María Luisa is one of the best things to see in Seville. Take a stroll through this sprawling green park that leads to the enchanting Plaza de España. Let yourself get lost in the greenery of Seville’s most beautiful park before heading to the Plaza de España, arguably Seville’s most stunning plaza. Once inside the half-circle shaped Plaza de España, you can walk around the edges of it to see beautiful artwork depicting each Spanish province. You can also rent a pedal boat for 5€ and give it a go around the man-made moat that traces its way around the plaza and under beautiful brightly painted bridges. And if you’re looking to relax one night, why not do so in one of the nicest hotels in Seville? Have a drink on the rooftop terrace of Hotel EME, precisely the hotel you’ll be staying at while in Seville with the Flavors of Andalucia guided tour. Sipping on a refreshing drink while face-to-face with one of the most important cathedrals in Europe will be an unforgettable experience. Finally, when all is said and done, and you’ve toured all of Andalucía up and down, you’ll be grateful for a night of complete relaxation in a traditional Arab bath. Buried in the heart of the Santa Cruz neighborhood is a beautiful and enchanting baño Arabe, or Arab bath. As part of the Flavors of Andalucia guided tour, you’ll spend your last night of your trip relaxing in the baths, going in and out of hot and cold pools and enjoying the refreshing steam room, all while taking in the beautiful tile work and traditional Moorish architecture. 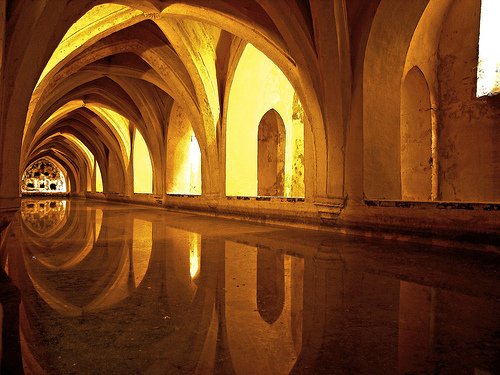 Step into the past and let yourself relax in truly one of the most exquisite places in Seville.